Home Paris	Sparkling Wine vs Champagne – What’s the Difference? While there are several types of sparkling wines, only one kind is synonymous with celebration and sophistication worldwide. Legally speaking, only bottles of sparkling wine produced within 100 miles of the Champagne region of France are “Champagne”. This verdant area, 129 square miles of productive vineyards, is responsible for the beloved drink of royals and bottle poppers everywhere. Here’s what you need to know. The Paris Guy leads several Paris Tours, in addition to day trips from Paris. 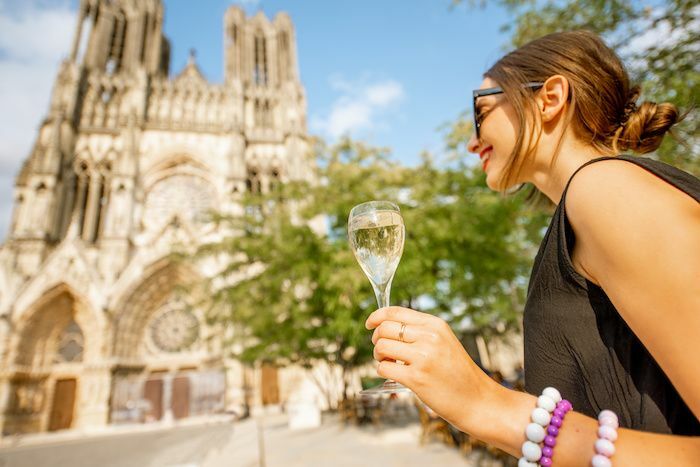 If you want to visit the Champagne region of France from Paris, including a visit to Épernay and the Abbey of Hautvillers. Within the terroir (natural environment) of this prized part of France, a myriad of grapes grow in the mineral-rich limestone soil. However, only seven types are allowed in the production of Champagne. Pinot Noir, Pinot Meunier and Chardonay are the main grapes used in almost all types of official French Champagne. Only sparkling wine from this region is considered legit in terms of donning the Champagne label. And so, this is principle difference when it comes to sparkling wine vs Champagne. In addition to these three grapes, Fromenteau, Pinot Blanc, Petite Meslier and Petite Arbanne are also allowed in the production of sparkling wine. Each grape lends a distinct flavor and structure to the finished product. Consequently, each vineyard strives to find the best combinations to blend. The key process in the production of all sparkling wine is two rounds of fermentation. In comparison, still wine requires only a single round of fermentation. In other words, the first round creates the base or cuvée, and the second makes bubbles. The most expensive and widely-appreciated sparkling winemaking method, the Méthode Champenoise, is aptly named after the region of France. With secondary fermentation taking place entirely inside the bottle, the Champagne method is much less efficient than the more modern “tank method” (see next section). Either comprised of one type of grape, or a blend of different ones, selecting and mixing the cuvée is a highly-skilled task. After this first step is completed, the cuvée is combined in the bottle with a mixture of sugar and yeast called “liqueur de tirage” – then the magic happens. Only sparkling wine produced in the region of Champagne dons the label “Champagne”. However, other sparkling wines are also highly-prized. For example, Prosecco, the crisp and bright Italian sparkling wine is beloved far beyond the peninsula. After all, who doesn’t love the fizz? Especially as an aperitif, or alcoholic drink enjoyed before a meal, the Bellini cocktail is served in bars and restaurants far beyond the Venice Lagoon. First served at Harry’s Bar, a hangout for literary heavyweight Earnest Hemingway, a Bellini cocktail is mixed with Prosecco and peach puree. Prosecco isn’t produced using the Méthode Champenoise, but instead with the “Charmat Method”. Also known as the “tank method”, the secondary fermentation occurs inside a big, steel tank, instead of a bottle. By far, more cost-effective than the Méthode Champenoise, the modest price tag of Italian sparkling wine reflects this. As a result, Prosecco is considered an everyday sparkling wine. Many people attribute the birth of sparkling wine is to French ingenuity. However, thanks to scholars, it’s now established that sparkling wine was roundly enjoyed in ancient Rome. For example, Cleopatra and Emperor Julius Caesar enjoyed sparkling wine. This fact and other references to the production of effervescent wine appear in the works of Roman writers including Lacan, (A.D 39 – A.D. 65), Pliny the Elder, Columella and Virgil. To this day, many of the wine making techniques developed in ancient Rome are still used. Whether implemented in still or sparkling wines, the wisdom imparted to us by ancient Romans is responsible for countless hours of sipping the nectar of the gods! Contrary to popular belief, 17th century Benedictine monk Dom Pierre Pérignon did not invent Champagne. However, he did contribute to significant advancements of the beloved beverage. Born in 1638 as the youngest of seven children, Pérignon’s father owned several vineyards in the Champagne region. After entering the Benedictine order of monks at age 17, he eventually became the cellarer at the Abbey of Hautvillers. This is where his legacy came into play. Among his other duties, Pérignon worked on improving several aspects of champagne-making. Due to the local climate, winemakers often grappled with carbonation bubbles that appeared during the fermentation process. Often leading to the explosion of bottles, the bubbles ended up wasting a lot of product. And so eventually, Pérignon decided to the make the best of the land’s natural conditions. It was then that he developed the innovations still used by sparkling winemakers today. Thanks to Pérignon, the Abbey’s vineyards prospered. Among other things, the celebrated monk made great strides in blending grapes and creating an artful cuvée, prior to secondary fermentation. These achievements are the reason why Moët & Chandon decided to name their most-famous vintage Champagne after the monk. When a Champagne or wine is labeled “vintage”, it means that it created entirely using grapes harvested in a single specified year. Whether you prefer Champagne to Prosecco, all sparkling wine imparts the same joie de vivre. If the high-end appeal of a bottle of Dom makes you feel like a King or Queen, that’s the right choice. If on the other hand, you prefer sipping a Prosecco in a medieval piazza as the sun sets over Rome, thank the ancient Romans. There is no single correct way to enjoy bubbles, so à votre santé!